Amarnath is a popular pilgrim shrine dedicated to Lord Shiva reported to be around 5000 years old. Thousands of people from across the country make a pilgrimage, or yatra up to the cave shrine of Amarnath, located in the Kashmir Himalayas through rocky terrains, snowy mountains, rain-swollen streams and a glacier-fed lake under unpredictable weather conditions. The shrine is situated at a height of 3,888 metres (approx.12,700 feet) above sea level near Pahalgam in the mountainous area in south Kashmir, 141 kilometers from Srinagar. It is said that Lord Shiva explained the secret of salvation and the path to immortality to his consort Parvati in this cave which was overheard by a pair of doves who became immortal and made this cave their eternal abode. Pilgrims still report seeing these doves at the cave. There are several legends behind this cave. According to popular belief, it was a Muslim shepherd, Buta Malik who discovered the cave and the natural Shivalingam of ice, (Symbolic of Shiva's role as restorer, the lingam is worshipped throughout India) more than a century ago. Buta Malik was given a sack of coal by a 'sadhu'. But when he opened the sack at home, he found that it was full of gold. Overjoyed he went back to thank the sadhu but found the cave on the spot where they met. From then on, the cave was venerated as a pilgrim centre. A representative from the Malik family would be present at the holy shrine along with the Hindu priest during the time of the pilgrimage and a percentage of the donations is still given to Malik's descendants. The cave which faces south is about 150 feet high and 90 feet wide and its walls are made with gypsum. Within the cave, there are two gaps. Of the two gaps, one is bigger and it is below this gap that the ice formation resembling Shiva- linga representing the main deity is formed by the drops of water dripping from the top of the cave. It is believed that the water is coming from the holy Ramkund Lake, situated above the cave. 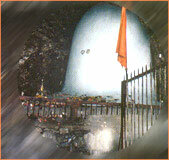 Devotees believe that one can get salvation by witnessing this 'Ice-Shiv lingam'. The full moon day in the lunar month of July / August (Shravana month) attracts maximum number of pilgrims as the ice lingam attains maximum height during this time. On the left of this main linga there are two other ice - lingams, representing Parvati and their son, Ganesha. The cave of Amarnath is dark inside and there is another small cave on the left of the Linga from which a chalk-like substance is dug out. This substance is given to the pilgrims as vibhuti (sacred ash) of Amarnath by the Mahomedans of the Batkut village. On the bed of the stream called Amarganga which is on the western side of the cave, there are huge quantities of this white substance which pilgrims apply on their bodies to protect themselves from severe cold after they have had their bath. This is called 'amar vibhuti'. Mahomedans of the Batkut village have 'rights' over this as they do over one-third share of the offerings made in Amarnath. These rights have been given to the locals as they have, for many years, been clearing the difficult passage and keeping the holy cave accessible. 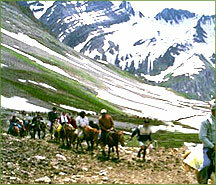 The annual yatra (pilgrimage) to Amarnath cave started in the year 1850 AD. The Yatra is organised every year by the Jammu and Kashmir Government during the month of Sharavan ( July and August) and lasts for approximately 40 days. Shri Amarnathji Shrine Board (SASB), manages the shrine and looks after the annual affairs of the pilgrimage and they make adequate arrangements for the pilgrims at the Pahalgam and Batkal base camps and the cave shrine, and several halting points in between. Due to terrorist threats, the area is now under the control of the Indian Army and the security is tight. Every pilgrim is examined and every piece of luggage is inspected. Security men in bulletproof jackets line the road every 50 metres or so right from Jammu, checking every bush and culvert round the clock. The nearby hills are also secured. For the yatra, advance registration has to be done -about a month ahead before commencing the journey and the pilgrims are given a particular day on which he or she can have the darshan. Pilgrims can register through the designated branches of Jammu and Kashmir Bank across the country. A medical certification is needed before registering as a pilgrim. Children below 12 years are not allowed. There are two routes to reach Amarnath shrine, 1) via Pahalgam, Chandanwari, Pissu Top, Sheshnag and Panchtarni (46 kms long) takes 4-5 days 2)the steeper but shorter route Via Baltal, Domail and Barari (14kms) takes two days. People who are unable to climb, could use donkeys, ponies or have themselves transported on chairs or palanquins carried by two porters. Ration and fire wood quota are available from government depots at all stations enroute. The longest and the oldest traditional route which takes four to five day up and down is via Pahalgam, which is 96 kms from Srinagar. Around 16 km (10 miles) from Pahalgam is Chandanwari, a small picturesque valley at 2,895 m (9500 ft). .The road from Pahalgam to Chandanwari is relatively flat terrain, along the picturesque Lidder river with quite a few steep curves. It can be accessed by car with some skilled driving, mini buses are also available. From Chandanwari onwards the track becomes much steeper, being accessible on foot or by pony only. 11 km from Chandanwari is the mountain lake of Sheshnag (11730 ft) which is the second night's camp, after which, 13 km away is the last stop, Panchtarni (12729 ft) where 5 rivers flow below the Bhairav mount. A narrow spiraling path, 6 kms from Panchtarni leads to Amarnath Cave. An early morning start is recommended for there will be a long queue awaiting entry at the cave. The trek is very steep and therefore needs great caution and care. Most of the journey requires trekking through the picturesque Pahalgam and pilgrims can camp at Pahalgam or Chandanwari. The other shorter route is Via Baltal (14kms) in North Kashmir. Pilgrims can camp at the Batkal base camp, 102 km from Srinagar and begin their upward journey to the shrine early in the morning and return back to the Baltal camp late in the evening. Only really fit people can make it back on the same day. From Baltal to Domail is 2kms and from Domail to Barari is 5km and from there to Sangam where the two routes meet is 4kms and from there to the cave shrine is 3kms. Baltal is more popular because of its helicopter services run by Himalayan Heli Services and Deccan Aviation, which in about 7 minutes can drop you at the Holy Cave. Children up to two years can travel free of charge by air.